If you missed the Smashing Pumpkins’ last massive tour, then you’re in luck!! The alternative rock trio have barely taken a moment to rest from their massive 30th anniversary tour before heading out again. 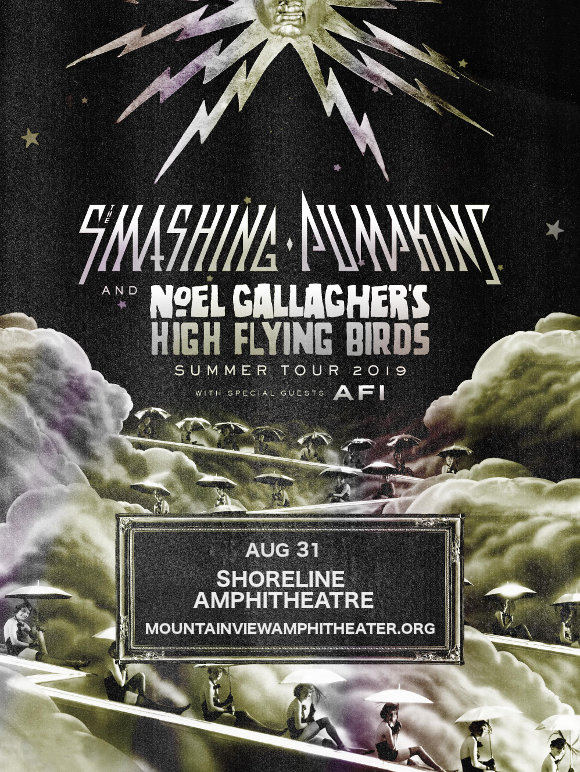 Get ready to join them and Noel Gallagher's High Flying Birds at the Shoreline Amphitheatre on Saturday 31st August 2019 – tickets are going to sell out fast, so get yours quickly while you still have the chance! Last year, Billy Corgan, James Iha, and Jimmy Chamberlin reunited to celebrate the 30th anniversary of their groundbreaking, genre-defying band. Established in 1988, the Smashing Pumpkins began with a punk-rock sound that soon grew to incorporate genres including electronica, shoegaze, and gothic rock. With their unique diversity, they went on to became one of the most influential bands of the 90s, selling millions of records around the world, before various issues within the band caused their eventual break up in 2000. So it was music to fans ears when the band reunited with some of its old members. As if three decades of hits weren’t enough, this tour will also feature songs from their brand new album; “Shiny and Oh So Bright, Vol. 1 / LLP: No Past. No Future. No Sun,” a comeback album that showcases the Pumpkins at their nostalgic best while still giving fans plenty new material to sink their teeth into. “I want my band back, and my songs, and my dreams,” wrote Billy Corgan prior to the album’s release. Seems he’s got them all! What are you waiting for?? Those tickets won’t last – grab yours today! !